I’m not going into any lengthy explanations for each idea – it would take far too long as there are loads – but there’s a clickable link beneath each one and a price*, so just follow the link for more info. Happy online queue-less stress-free shopping! 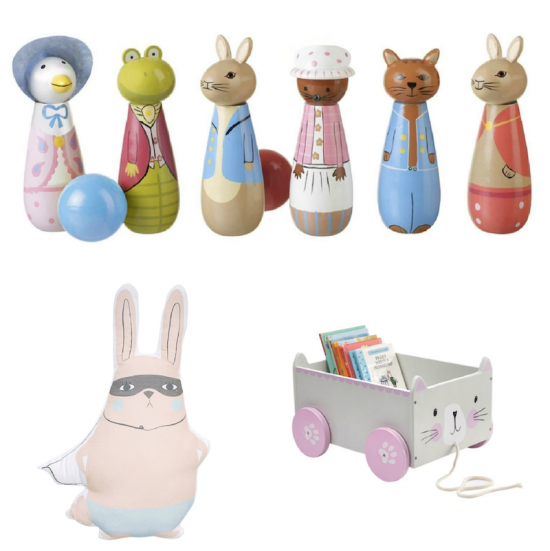 Beatrix Potter Wooden Skittle set, £15.23 online here; Scamp & Dude Superhero Sleep Buddy, £40 here; Cat Pull-Along Book Cart, £38 here. 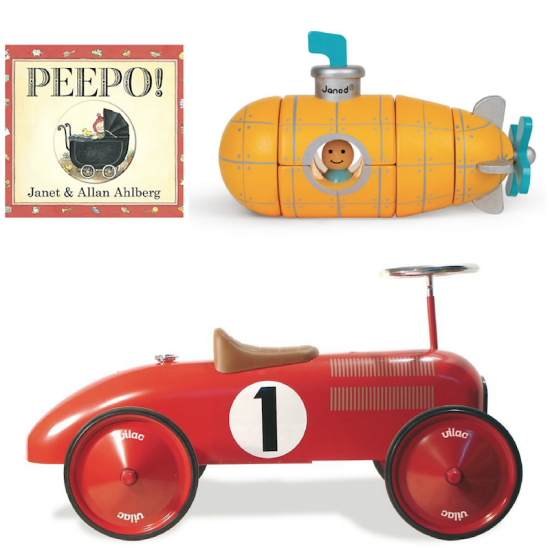 Classic Peepo Hardback Book, £5.24 here; Janod Magnetic Submarine, £16.95 here; Vilac Ride-On Metal Car, £76.48 here. 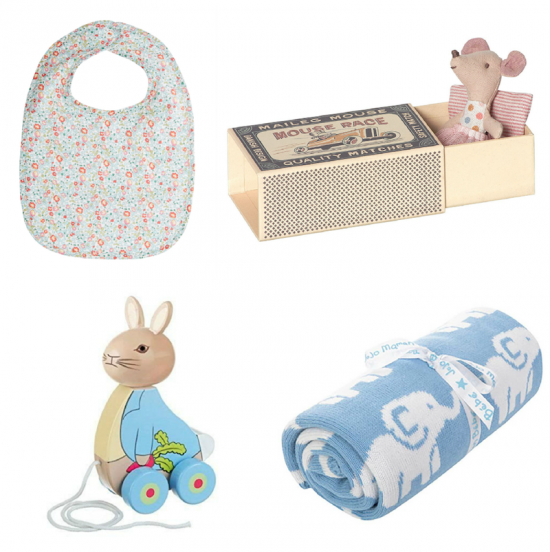 Liberty Print Bib, £13 here; Maileg Mouse in Matchbox, £16.95 here; Jojo Maman Bebe Elephant Knitted Shawl, £22 here; Peter Rabbit Pull-Along, £9.16 here. 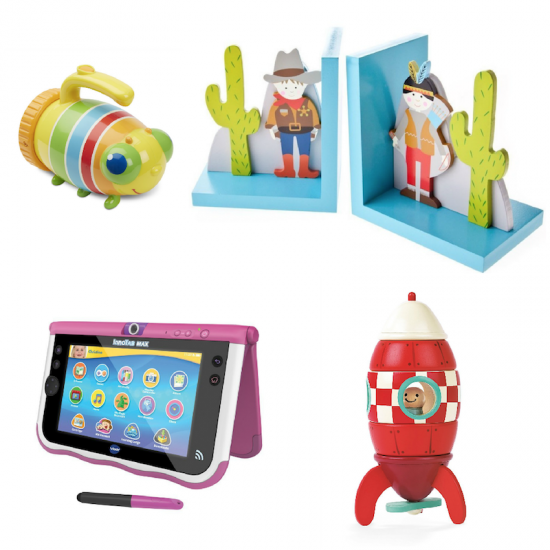 Melissa & Doug Bug Torch, £7.99 here; Gisela Graham Bookends, £9.95 here; Janod Magnetic Rocket, £15 here; VTech Innotab 7-inch, £61.18 here. 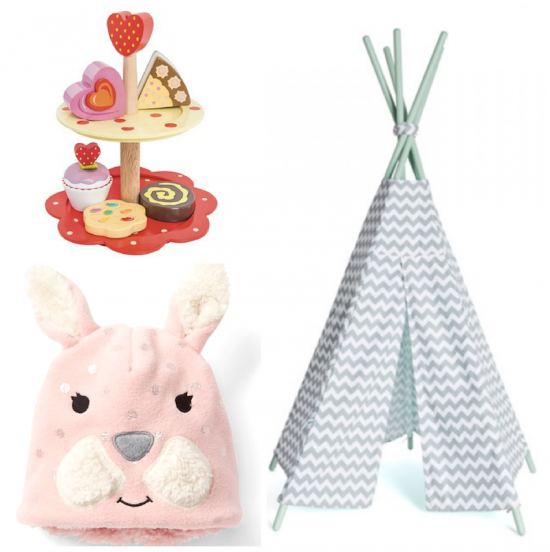 2 Tier Wooden Cake Stand Set, £16.50 here; Mokee Tipi with mint green sticks, £79.95 here; GAP Fleece Rabbit Hat, £6.95 here. 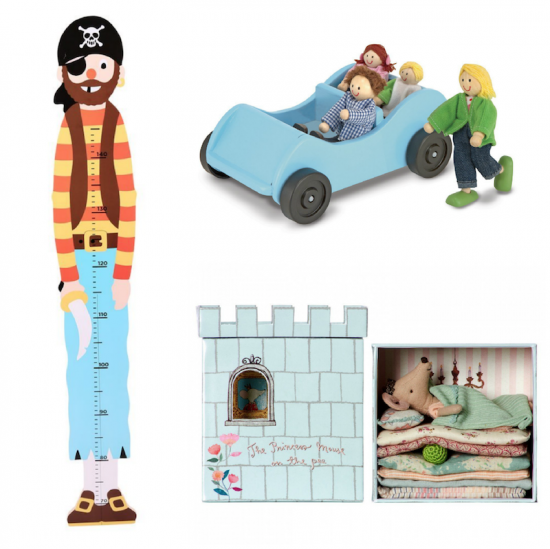 Pirate Height Chart, £6.99 here; Melissa & Doug Wooden Car and Dolls, £13.99 here; Maileg Princess and the Pea Mouse, £40 here. 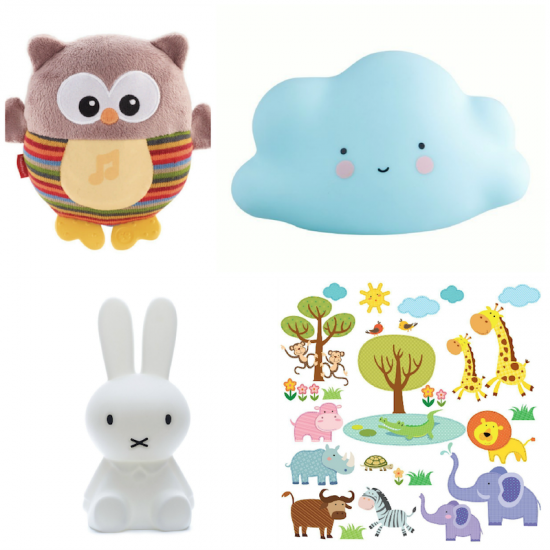 Fisher Price Soothe and Glow Owl, £10.89 here; Mini Cloud Light, £15.29 here; Decowall Jungle Peel and Stick Nursery Stickers, £10.80 here; 50cm Miffy Light, £129 here. 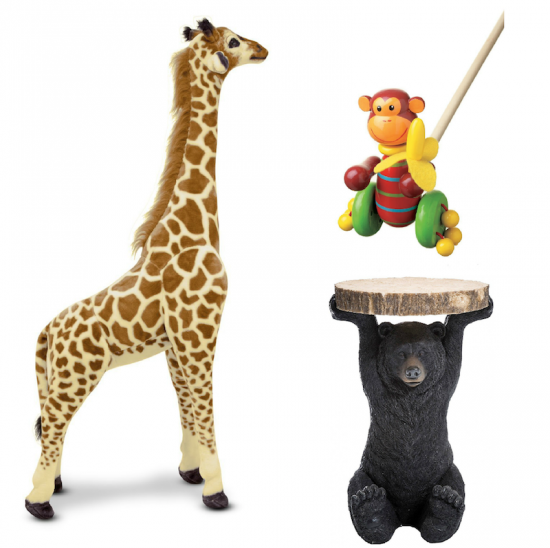 Melissa & Doug Giant Giraffe, £52.49 here; Wooden Push-Along Monkey, £10.92 here; Bear Side-Table, £120 here. 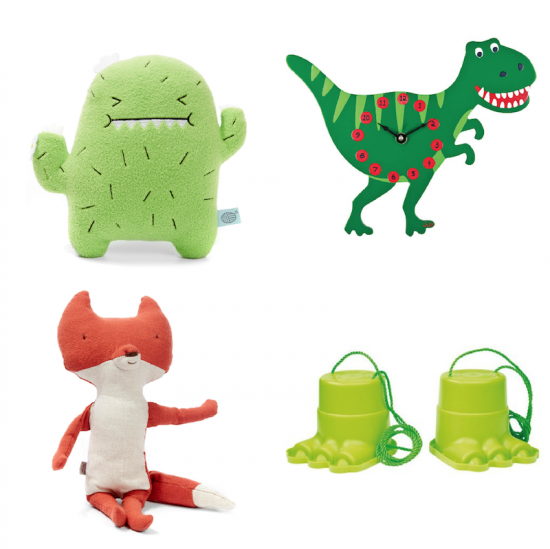 Riceouch Toy from Noodoll at Liberty, £19 here; Jojo Maman Bebe Dinosaur Clock, £16 here; Monster Feet Stilts, £7.28 here; Fox Toy from Maileg at Liberty, £21.50 here. 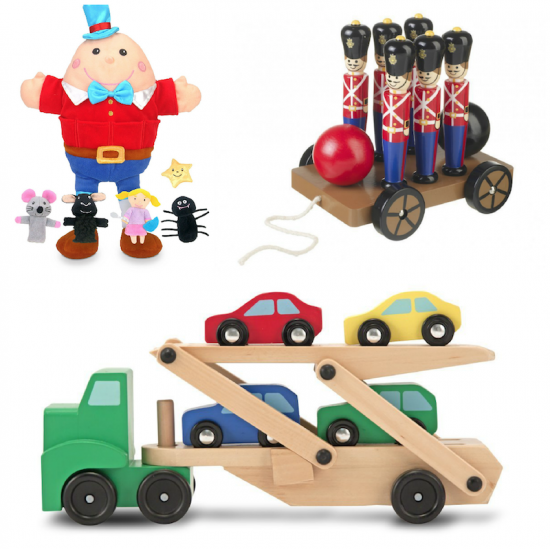 Humpty Dumpty Puppet Set, £18.25 here; Toy Soldier Skittles on Wheels, £18.98 here; Melissa & Doug Car Transporter, £11.84 here. 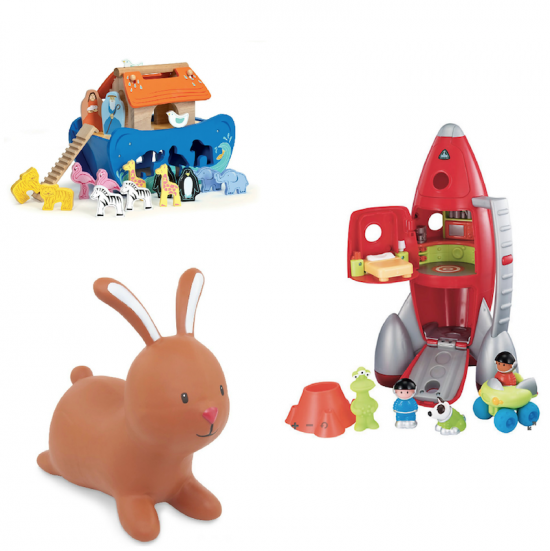 Le Toy Van Wooden Shape-Sorting Ark, £25.87 here; ELC Happyland Rocket with Alien and Spacemen, £35 here; Mothercare Rabbit Hopper, £20 here. 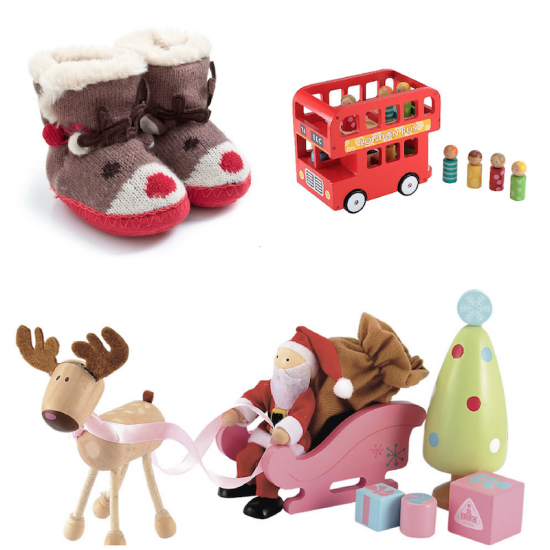 Jojo Maman Bebe Christmas Reindeer Slippers, £16 here; ELC Wooden London Bus, £20 here; ELC Wooden Christmas Set, £12 here. 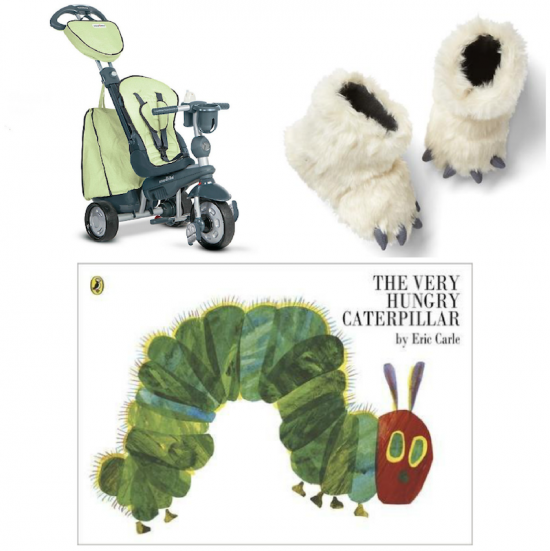 Smart Trike Explorer, £79.99 here; GAP Yeti Boots, £12.95 here; The Very Hungry Caterpillar Board Book, £3.99 here. 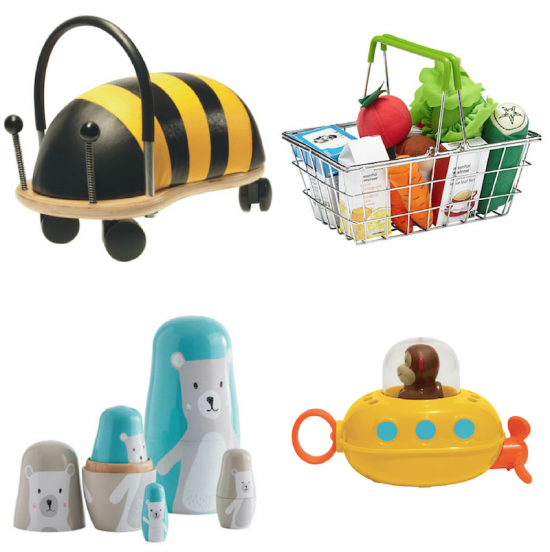 Wheelybug Ride-On Bumble Bee, £47.90 here; John Lewis Fabric Food In A Basket, £12.50 here; Jojo Maman Bebe Pull & Go Submarine Bath Toy, £8 here; GLTC Russian Bear Dolls, £18 here. *I have attempted to find the best prices for most of the toys shown here, at time of publishing, but apologies if I’ve missed any deals! As detailed in the sidebar disclaimer, which is always present, outbound links from this site are usually affiliate links which means that I get a very small percentage if a purchase is made. Do feel free, if you don’t wish to use my links, to Google in a new window!